Product prices and availability are accurate as of 2019-04-22 18:46:08 UTC and are subject to change. Any price and availability information displayed on http://www.amazon.com/ at the time of purchase will apply to the purchase of this product. I highly recommend reading multi-published historical writer, Kev Richardson, who has an exceptional knack of introducing the reader to a foreign land, making you feel as though you've actually been there. 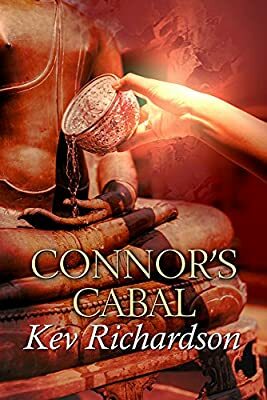 Connor’s Cabal is a “must read,” as Connor's family join together to tackle a sinister Thailand thug that has kidnapped Connor's hired teenage travel guide. Can Connor or his family cabal outwit the kidnapper and his henchmen? 5 Stars... Action-Adventure indeed! Kev Richardson’s latest work Connor’s Cabal keeps one turning pages. Kidnap and threats of murder ensure one stays mesmerised. And oh, that ending—real nail-biting stuff! Following a career in business management at international level, Kev attained a degree in journalism to then sweat as far up the River Nile as one can get, canoe down the Amazon, flash countless rolls of film from atop the Eiffel Tower, the heights above Yosemite, the Victoria Falls et al, scream “Ole” at a Chihuahua bullfight, ride elephant trails in Thai jungles, wallow in the incredible history of Rapa Nui’s Maoi, and as convention almost demands, was mugged in Bogota. His articles on travel to exotic lands have featured in travel and airline magazines around the world. Meanwhile, being a sixth generation descendant of Australia’s First Fleeters with an obsessive interest in Australia’s founding history, he was concerned over the generations of suppression in the education of Australians, on clouding the truth in what really happened. Years of fact-finding with the help of other dedicated researchers revealed all and Kev vowed to set the history books aright by bringing the brutal truths of convictism to light. He is well qualified to do so for as a student of First Fleet history he has presented his subject on many occasions in press, radio and television interviews. He is a Past President of ‘The First Fleet Fellowship’ and a Past Secretary of ‘The Descendants of Convicts Inc.’. During Australia’s 1988 Bicentenary he officiated in Founding celebrations in Sydney, Melbourne, Hobart and Norfolk Island and for his work during that Bicentenary, was created Honorary Life Member of ‘The Regiment of Redcoat Descendants’. Kev now devotes his life to writing on not only his country’s convict history, but general fiction with an Australian flavour. He recognises the growing trend towards digital reading so follows the world’s top authors in publishing his works both as traditional paperbacks and eBooks. His Gurrewa and Brogan series released by Wings ePress are followed by Letitia Munro in October 2008, To Plough Van Diemen’s Land in June 2009 and The Terrible Truths in December 2009, the last three being more works on his country’s convict beginnings. Short synopses of all can be read on www.kev-richardson.com. And more works are in the pipeline. These days Kev travels less, having retired from his Gold Coast home, left his grown family and friends to write from experiences and adventures during his exciting travels, happily ensconced in the foothills of the Golden Triangle in amazing Thailand’s exotic north.